Under the One Ford policy where any model they produced globally, subject to meeting local demand and legislation requirements, could be sold in any market, the EcoSport compact five-door SUV first saw light in 2013 to meet low cost South American markets. As the compact SUV market grew worldwide for such sized models production was increased with the EcoSport also being built in India and China as well as Brazil. 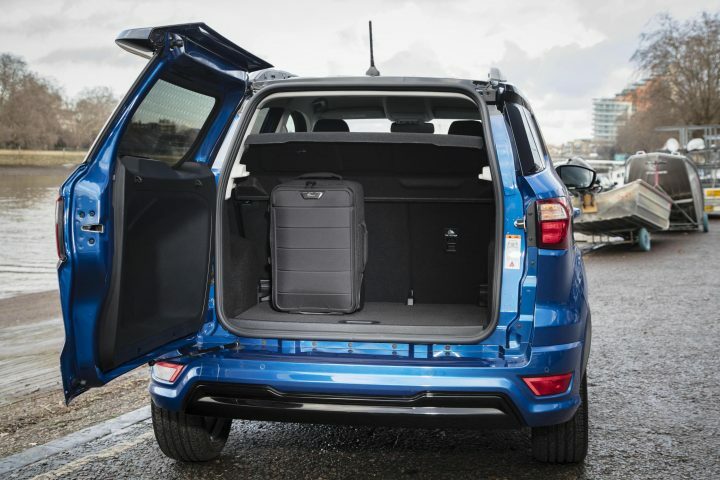 The EcoSport first arrived in the UK in 2014 and it didn’t receive much praise or sales due to its indifferent build quality, poor handling and its side-hinged load area rear door complete with ungainly door mounted spare wheel instead of the commonplace more user-friendly tailgate we had all got used to with hatchback styled models. A year later Ford upped the quality of the vehicle, fitted new generation engines, reworked the suspension and steering, improved equipment levels and removed the rear door mounted spare wheel. In 2018 Ford gave the EcoSport another major evolution to capitalize on the ever increasing European demand and introduction of evermore competitor models. Production for Europe was moved to Romania where the evolutionary EcoSport used their best selling Fiesta range underpinnings plus the interior styling from the Fiesta. Additionally new trim levels, more personalisation options were applied and the exterior looks tweaked to mirror Ford’s Kuga and Edge SUV model ranges. 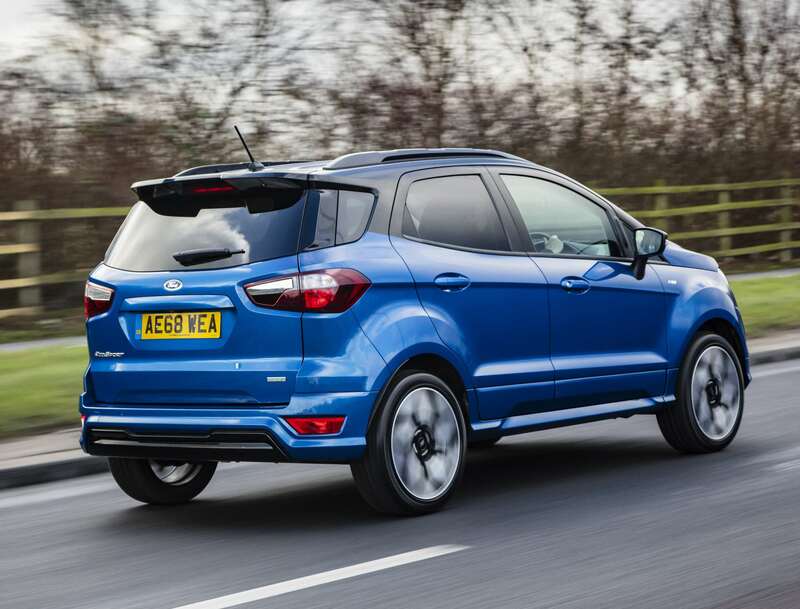 Ford’s EcoSport, Kuga and Edge SUV ranges sold over 260,000 units, a new record, in Europe in 2018 of which over 60,000 were in the UK. The latest EcoSport range achieved over 105,000 sales in Europe last year, an increase of 105% with 23,000 sold in the UK, an increase of 62%. Back to the here and now, the upgrading, reworking of the EcoSport and moving production for European markets to Romania has worked for Ford despite the ever increasing competition in the compact SUV sector. 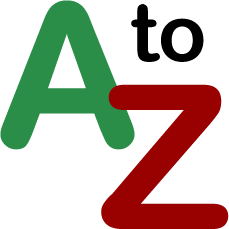 The competitor ranges include the Nissan Juke, Suzuki Vitara, Kia Stonic, Hyundai Kona, Renault Captur, Audi Q2, VW T-Roc, SEAT Arona, Mitsubishi ASX, Jeep Compass, Vauxhall Mokka X, Peugeot 2008, Citroen C3 Aircross, Dacia Duster, MG ZS and Mazda CX-3. 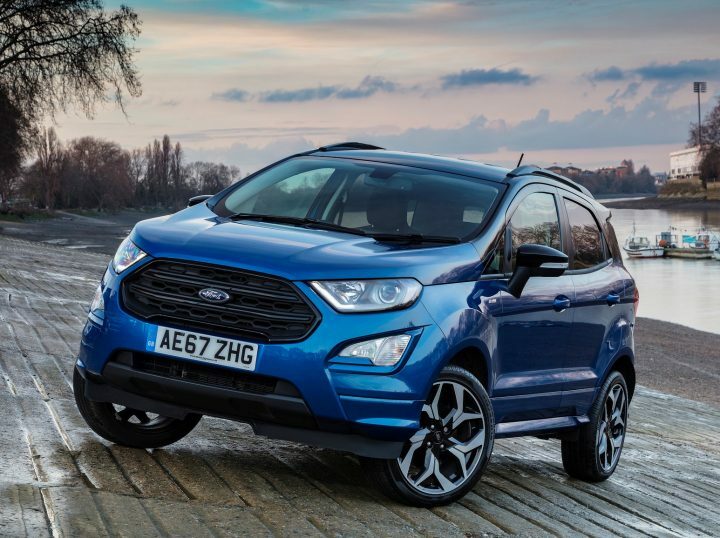 Price is critical in this competitive sector and the latest Ford EcoSport range starts from £17,845 and progresses to £24,250. All versions have a five door layout with the usual Ford brand Zetec, Titanium and the just introduced sportier ST-Line spec levels. 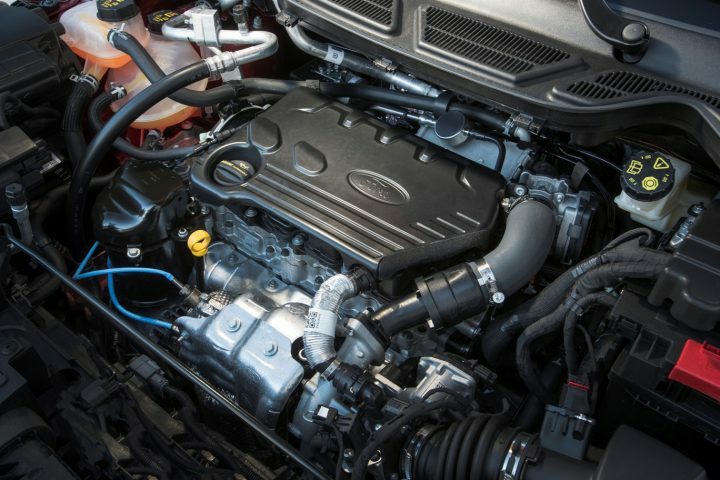 Engine options, depending on the spec level, are turbocharged petrol 1.0-litre EcoBoost 100hp manual, 125hp manual or auto and 140hp manual – all 2WD. Turbodiesel options are the new 1.5 EcoBlue TDCI 100hp manual 2WD and the 125hp unit with 2WD or intelligent 4WD options both with new low friction six speed manual gearboxes. The latest Ford EcoSport features bold and chunky SUV styling, reflecting that of the mid-sized Ford Kuga and large Edge models. A sculpted bonnet with a central bulge sweeps up to meet the thick at the base A-pillars which in turn are steeply raked rearward giving a strong looking front-end appearance. The 2019 news from Ford UK started on a very positive note with PR announcements that in 2018 the brand achieved their 42nd successive year of new passenger car sales and 53rd consecutive year of commercial vehicles sales leadership. Their Fiesta was the UK’s top selling car for the 10th consecutive year, their Transit range was the UK’s best selling commercial vehicle range and their Ranger models continued to be the UK’s best selling pick-ups. But by the second week of January the news was not so good. Due to falling global demand, huge financial losses in Europe, falling demand for diesel models and of course Brexit, the company announced a major restructuring for Europe to make it more competitive. 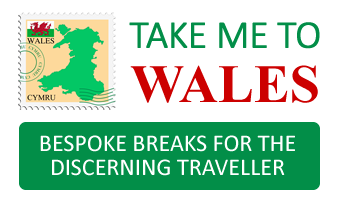 Those plans include a proposed cut of 1,000 jobs at its Bridgend plant in Wales where their EcoBoost petrol engines are produced as well as larger capacity engines for Jaguar Land Rover, but that contract ends this year. Now news out this week that Ford and Volkswagen AG have launched a global alliance. Through the alliance, Ford will engineer and build medium-sized pickups for both companies which are expected to go to global markets as early as 2022. For both parties, Ford intends to engineer and build larger commercial vans for European customers and Volkswagen intends to develop and build a city van range. Both parties are looking at potential collaboration on EVs autonomous vehicles and mobility services. The thick lower A-pillars do restrict front quarter visibility for the driver. The front-end design is also dominated by a new large trapezoidal grille design and distinctive angular headlights. Angular fog light housings complete a front three quarter profile that was inspired by the straps of a rucksack and designed to reflect an adventurous character say Ford – well now we know! EcoSport’s rear bumper and tail light designs also are revised to deliver a cleaner, more sculpted appearance. The newly added ST-Line styling specification adds 17-inch sports alloy wheels, large rear spoiler, ST-Line design grille and unique front and rear bumpers and hidden underneath is ST-Line sports suspension. Customers can choose from 12 bold exterior colours, including Lightning Blue, Ruby Red and vibrant metallic orange shade, Tiger Eye; and can further personalise their SUV with the new contrasting extended painted roof colour option. 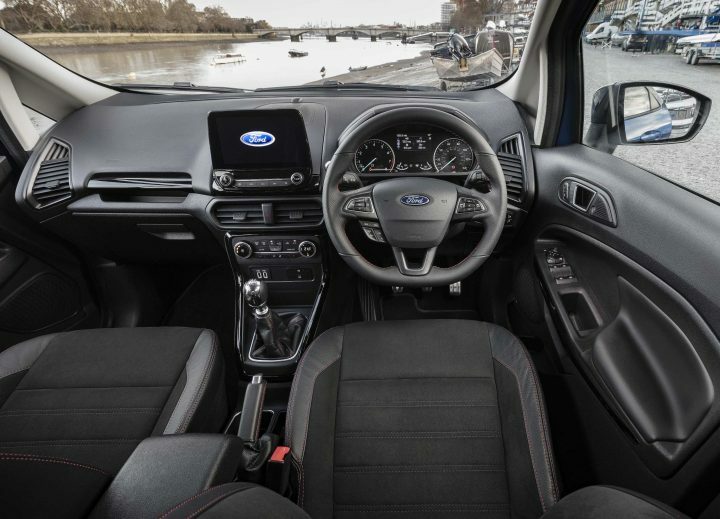 The latest EcoSport now also delivers a new level of interior refinement with easier to use controls and soft-touch materials and a new centre console ergonomically designed for easy operation and featuring fewer buttons. The fascia design is more or less transferred from the top selling Ford Fiesta models, which is a positive move. 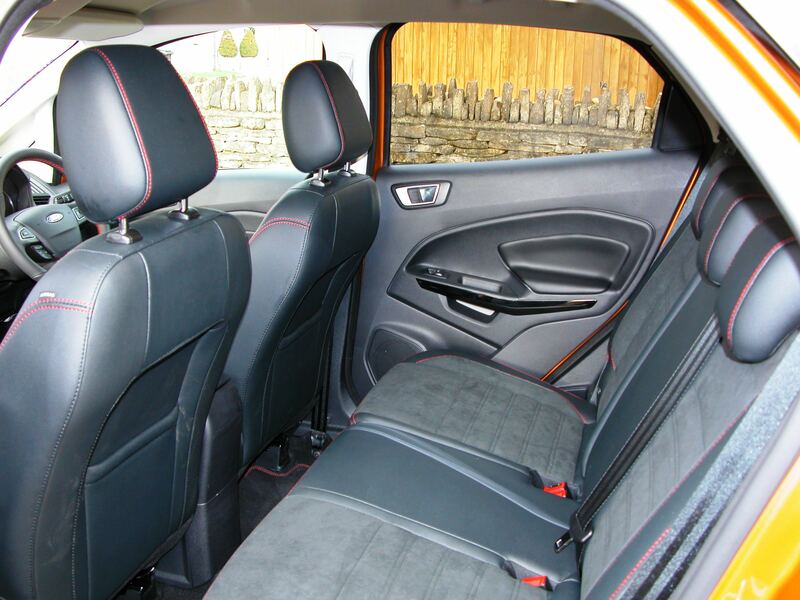 The new seat designs provide greater front interior space but the rear seat legroom is still limited just as it is with the Fiesta hatchbacks. The partial leather upholstery for the Titanium and ST-Line models improves the interior quality. It’s just a pity that heated front seats and steering wheel are a £250 extra cost option for even the top spec level models. Occupants can however match the ambience to their mood with adjustable interior lighting that can be set to one of seven colours. The interior features a series of smart stowage solutions, including a new height adjustable boot floor that can be raised to provide concealed storage, or lowered to increase luggage capacity to 356-litres. Fold down the rear seats and the load space goes up to 1,238-litres, not class leading but adequate. The side hinged load area door, rather than using a lift up tailgate, will still be an issue for some potential customers. A new centre console features a built-in folding, sliding passenger armrest with a storage compartment ideal for tablet computers or snacks. The Zetec spec level includes Ford’s very useful Quickclear heated windscreen, electrically operated and heated door mirrors, air-con, front and rear electric windows, trip computer, Ford Sync connectivity with an 8-inch touchscreen, DAB radio, emergency assist, Apple CarPlay and Android Auto functions plus leather trimmed steering wheel handbrake and gearlever. The Titanium level additions include larger 17-inch alloy wheels, auto lights and wipers, partial leather upholstery, cruise control, Ford Sync 3 sat-nav, FordPass Connect embedded modem, rear view camera with parking distance sensors and keyless start. The new ST-Line additions include unique exterior sports styling features, sports suspension, ST-Line logo on the front door threshold plates, sports pedals with stainless steel inserts and red stitching for various upholstered areas within the cabin including front and rear floor mats. My 2019 model year Ford EcoSport version was the new 1.5-litre EcoBlue TDCI 125hp 4WD manual with the new ST-Line specification and this is the top priced model in the range at £24,250. The same engine with 4WD, but with the more popular Titanium trim, costs £800 less. This will appeal to owners more interested in a compact easy to use all-weather capable diesel 4WD SUV rather than the more visually sports orientated ST-Line. With 300Nm of torque the four cylinder TDCI turbodiesel unit matched with the new six-speed manual gearbox is a nice combination with well spaced gear ratios, smooth gearchanges and its simple and easy to drive, just what most people want. Top speed is reasonable enough but not so appealing during my extended test driving period over the festive season was the real-life fuel economy. A series of long journeys, fairly lightly loaded coupled with the usual trips into my local town and some country road driving, the overall final figure was only 39.5mpg, well short of the official 52.3mpg Combined Cycle figure for my test 4WD model fitted with the £600 optional larger 18-inch Shadow Black alloy wheels. If fitted with the standard 17-inch alloys the official figure is 58.9mpg. Fitting the larger wheels also changes the CO2 figures from 125g/km to 140g/km so instead of paying £205 diesel rate VED First Year road tax by taking the 18-inch wheel option pushes this up to £515. And company car drivers instead of paying 30% Benefit-in-Kind tax with the standard alloys with the larger wheels they will pay 33%. So ignore the larger wheel option, it’s too costly. In real-life driving conditions the new Intelligent 4WD system is a comfort blanket, you can’t feel it working but it’s there constantly monitoring the grip available at each wheel and always shuffling the driving torque to the wheels with most adhesion on or off road. It’s no hard-core off-roader but it’s capable enough for muddy or gravel tracks and of course of real benefit if the vehicle is to be used for towing work. Being a country dweller I’d always opt for an SUV with 4WD but if I lived in an urban area and it was the school run transport perhaps not. As usual its ‘horses for courses’. Overall the latest version of the Ford EcoSport compact SUV is now the vehicle it should have been when first introduced to Europe in 2014. In everyway it’s much better, more expensive of course but what new car isn’t. What I also liked about the chunky EcoSport is that it looks like a proper SUV, not like so many competitor models that look like family hatchbacks with more ground clearance. 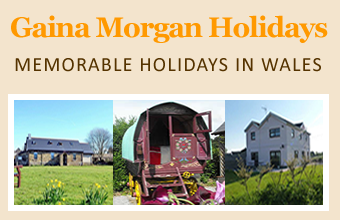 Certainly it now seems to be selling very well following its most recent improvements. Against: Real-life fuel economy was well below the official Combined Cycle figure, 18-inch alloy wheel option reduces fuel economy and increases tax costs, heated front seats only available as an extra cost option on higher spec models, not as much rear seat legroom or boot space as some other compact SUVs, side hinged load area door restricts access in car parks, ungenerous warranty.